We all cannot help but feel a little bit cheesy when it comes to celebrating Christmas. Think about all of the films that revel in the festive spirit get shown on Television every December! And we all cannot help but feel the joy of gaining a big number of winnings from every slot game that we play online. If you want to experience the two feelings at the same time from one single device, then take a seat and turn on Microgaming's Taco Brother. If you're all set, play UK video slots here! It takes a mix of mathematics and art to create fantastic games that many people can enjoy playing; Elk Studios has succeeded in creating that mix and embedding them into their iGaming products. Established in Stockholm, Sweden, the brand has managed to gain a tremendous amount of following due to its high and fast payouts. Payouts that can be processed from any device that you could think of. Smartphones, laptops, MacBooks, tablets, and so on! 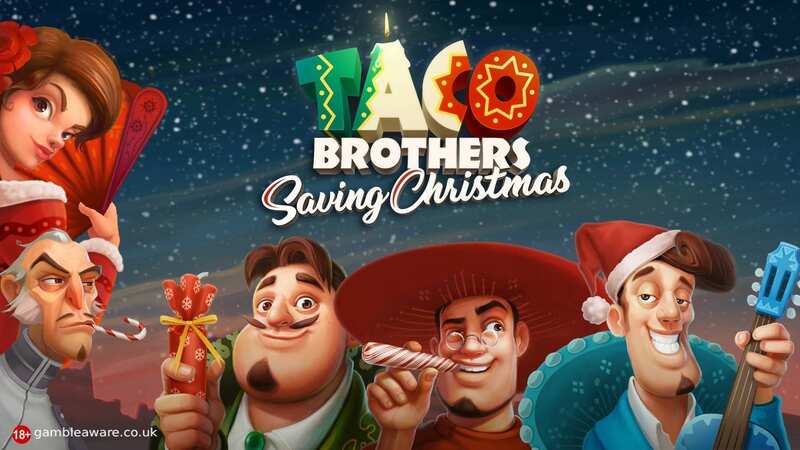 If you're already familiar with their previous game, Taco Brothers, you can be sure that you will feel the motion, cheesiness, and joy from playing Taco Brothers Saving Christmas! Go ahead and deposit and play our slot games made by Elk Studios at Wizard Slots. Like most games developed by Elk Studios, all of the important buttons that display the paytables, the coin bets, and the autospins are placed on the corners of the screens. To add to the theme of the game, you see the snow falling gently across the screen with the wintry Mexican city settled behind the 5x5 reel grid. Check our guide on picking the best slots when you click here. 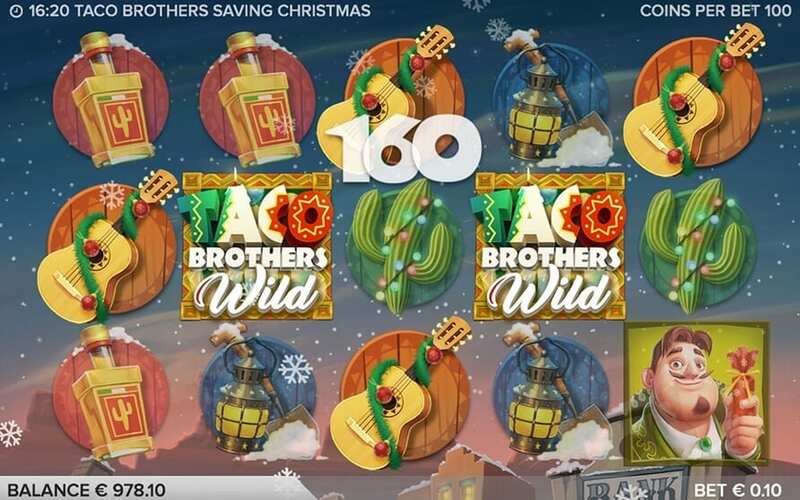 The base symbols that give you the low payouts come in the form of Spanish guitars, cacti, tequila bottles, and lamps & shovels covered in tinsel and baubles. And the base symbols that give you the high payouts come in the form of the trusty Taco Brothers: Paso, Pepe, and Pico! But they're not all that you have to look out for in the game, as there are many special symbols that can help get the prizes that you'd like to see underneath your Christmas tree! Bells WILD: This symbols substitutes all of the others except for the Safe and Taco Brothers WILD symbol. Taco Brothers WILD: This symbol activates a free re-spin whenever you see 3 of them in a matching combination, which will help you gain the 3 Safe SCATTERS. 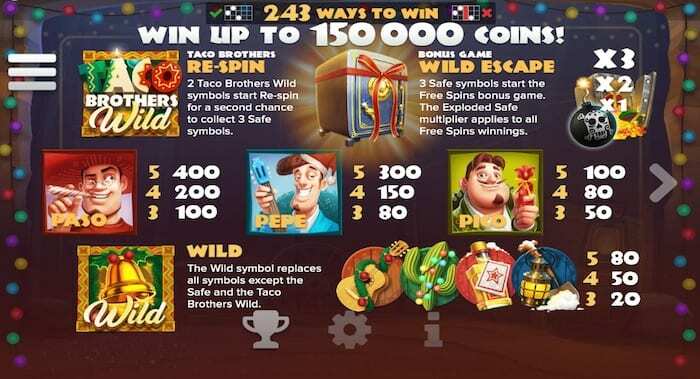 Safe SCATTER: When you get 3 of these symbols on the reels, you'll trigger the Wild Wild Escape Bonus Round: On this round that gets triggered by the safe symbols, you'll find a couple of multipliers that come in values of 1, 2, and 3, which will be added to your winnings on every win that you get on the free spins. Running WILDS: On the bonus game, the Taco Brothers that you'd have seen in the base game turn into running WILDS that move from right to left, and substitutes all of the symbols except for Captain Diaz and the Senorita. Captain Diaz SCATTER: On the bonus game, this symbol imprisons all of the running WILDS that may appear on your reels by dropping keys onto them. If they all end up in jail. The bonus game ends. Senorita SCATTER: Whenever the running WILDS end up in jail, this symbol releases them and restarts them on the reels again by giving you a free re-spin.